On December 11, RHI, in partnership with IC-IMPACTS and the Indian Spinal Injuries Centre (ISIC) announced the winners of the Canada India SCI Innovation Award – Getting Solutions to Market. RHI CEO Bill Barrable attended the special ceremony hosted at ISIC, in New Delhi. The 2017 report includes data from 663 new RHSCIR participants on observed trends in the traumatic spinal cord injury population like age distribution, level and mechanism of injury, where people go after injury to receive treatment, the duration of their hospital stay, and secondary complication information. The biggest finding was that the work of RHI is needed to address and reduce the substantial social and economic burden SCI imposes on persons with SCI, their family, their caregivers, and the health care system. RHI is pleased to announce Drs. Sandra Juutilainen and Melanie Jeffrey as recipients of a postdoctoral fellowship through the partnership between RHI, the Ontario Neurotrauma Foundation, and the University of Toronto’s Waakebiness-Bryce Institute for Indigenous Health; and Dr. Cindy Gauthier as the recipient of The Rick and Amanda Hansen Fellowship, in partnership with RHI and the Ontario Neurotrauma Foundation, through the University's Department of Physical Therapy. RHI was the title sponsor of the annual Working 2 Walk Science & Advocacy Symposium this past October and also sponsored the attendance of individuals across Canada. One of the attendees shares his experience at the Symposium. 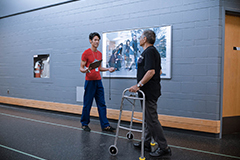 Read about the development of the Standing and Walking Assessment Tool in a recent article written by RHI Clinical Liaison, Kristen Walden and published in Synapse, a Canadian Physiotherapy Association publication. After a successful first year of the RHI-Hebrew University BioDesign Partnership, the teams from Hebrew University visited RHI from October 13-14. The intent is to produce original IP with a high potential for commercialization and bring the innovations to Canada. The teams are currently seeking start-up funding for their technologies. The North American Spinal Cord Injury Consortium (NASCIC) held its second annual meeting in October. 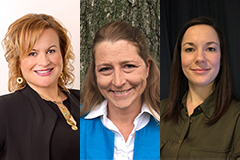 NASCIC brings together like-minded organizations, individuals, and groups to improve research, care, and policies impacting people living with SCI, their families, and community. Created as a result of discussions held at PRAXIS 2016, membership is open to any organization whose primary activity is SCI-related as well as individual consumers, with voting rights restricted to only SCI non-profits and consumers. ICORD's 5th International Autonomic Symposium will take place on February 13, 2019. This year's topic is "Women’s health after spinal cord injury." Following the Symposium, a Café Scientifique, sponsored by RHI, will bring together researchers, clinicians and community members to interact and engage in discussion about research and clinical practice for maternal health following SCI. RHI’s home, the Blusson Spinal Cord Centre turned 10 this past November. Watch this video to learn more about what makes Blusson so unique. Mills PB, Holtz KA, Szefer E, Noonan VK, Kwon BK. Early predictors of developing problematic spasticity following traumatic spinal cord injury: A prospective cohort study, The Journal of Spinal Cord Medicine, 2018 Oct 09. doi: 10.1080/10790268.2018.1527082. 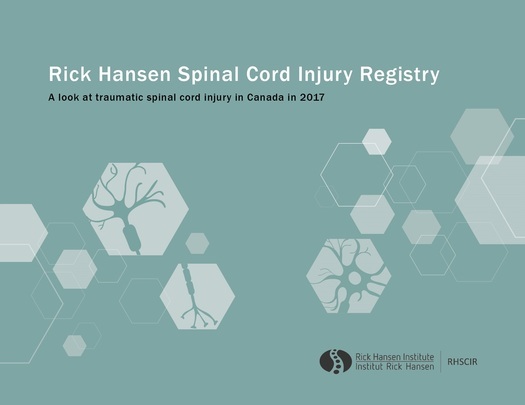 A Look at Traumatic Spinal Cord Injury in Canada: Rick Hansen Spinal Cord Registry (RHSCIR). The Journal of Spinal Cord Medicine, 2017 Nov;40(6), 870-871. doi: 10.1080/10790268.2017.1387124. You are receiving this email because RHI has received your express or implied consent to do so. If you no longer wish to receive emails from us, please unsubscribe using the link provided below.